Scientists already knew that some social bee species warn their conspecifics when detecting the presence of a predator near their hive, which in turn causes an attack response to the possible predator. Researchers at the University of Tours (France) in collaboration with the Experimental Station of Arid Zones of Almeria (Spain) have now demonstrated that they also use chemical signals to mark those flowers where they have previously been attacked. Researchers at the University of Tours (France) and the Experimental Station of Arid Zones of Almeria (EEZA-CSIC) conducted an experiment to study whether bees are capable of using evasive chemical signals to mark those flowers where they have previously been attacked. For this purpose, they simulated a predator attack and observed whether the bees advised the rest of their conspecifics of the danger of gathering nectar at a certain plant. “Evasive alarm pheromones provoke an escape response in insects that visit a particular flower and until now, we were not sure of the role that these pheromones played in social bees. 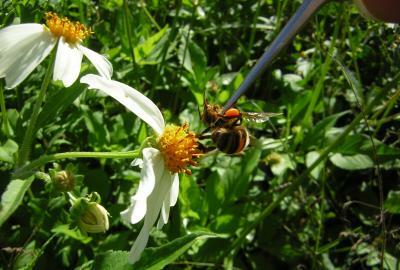 Our results indicate that, unlike solitary bees, social bees use this type of alert system on flowers to warn their conspecifics of the presence of a nearby predator,” as explained to SINC by Ana L. Llandres from the University of Tours and lead author of the study published in the ‘Animal Behaviour’ journal. In order to determine whether social and solitary bees responded to these olfactory alarm signals, an experiment was performed using individuals from both types and from different countries: Australia, China, Spain and Singapore. In some plants the predator attack was simulated by trapping the bees with pincers whereas in other cases control plants were used in which no attack took place. “Solitary bees responded similarly in the case of flowers that had been attacked by control predators and control flowers. However, social bees responded very differently,” explains L. Llandres. “Despite approaching both types of flower, the probability of landing on control flowers was much higher.” The scientists also detected that the probability of social bees rejecting flowers was much greater if a predator attack had been previously simulated. This study supports the idea that the sociability of bees is linked to the evolution of warning signals.